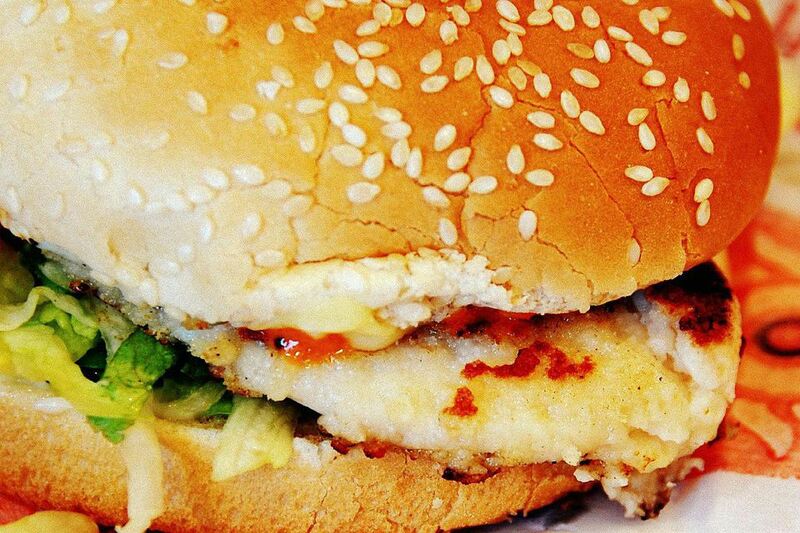 This Portuguese chicken burger recipe is our take on Australia's famous Bondi Chicken Burger. Our version starts with chicken breasts marinated in a chili sauce consisting of dried habanero chilis, chili flakes, paprika, lemon juice, garlic, ginger, and a little sugar. They are lightly dredged in flour then pan-fried. The traditional way to cook this chicken, especially when the bone is left in, is by grilling but pan frying gives you more control when working with fillets. In a metal mixing bowl, combine the chopped habanero chilis, lemon juice, ginger, vegetable oil, paprika, garlic, sugar, and chili flakes. Stir quickly to bind the oil and lemon juice. Spoon half of the sauce into a separate bowl and set aside for later. Add the chicken breast fillets to the remaining chili sauce and stir well to coat. Cover and refrigerate for 1 hour. Mix together the flour and salt. Remove the chicken breasts from the chili oil and shake off any excess. Lightly dredge the breasts, one at a time, in the flour-salt mixture. Once you're ready to cook the chicken, heat a medium-sized nonstick pan with a little vegetable or canola oil. Pan-fry the chicken breasts for several minutes on each side until cooked through -- internal temperature will register 165 degrees F.
Spread mayonnaise on the hamburger buns. Line the bottom of the bun with romaine lettuce, add a chicken breast, provolone cheese and then spoon on some of the remaining chili sauce. Serve immediately with a fresh green salad to cool the palate. This mouth-watering burger was born in a Portuguese charcoal chicken shop at Bondi Beach in Sydney but has spread throughout Australia and New Zealand. The shop, now known as Oporto, was established by Antonio Cerqueira. Today, there are more than 100 stores across Australia and New Zealand. Follow this simple recipe to see why it's so popular. The secret chili sauce recipe has never been divulged but we think our recipe is right on track.